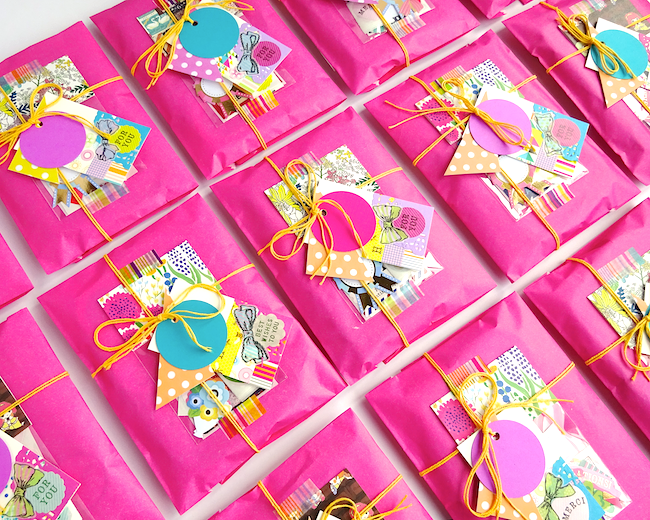 As I packed up a pile of pretty parcels this week, I couldn't resist snapping a few shots to share with you! Which, unfortunately (fortunately), were snapped up so quickly, I didn't have a chance to share them here. But, as the wrapping of this round turned out so nicely, I wanted to do a little show and tell. Pretty pretty, right? That's a sticker set on top - placed in a clear flat bag and then sealed with a piece of origami paper as a header card. I'm totally in love with the gorgeous floral paper - it's from a set of origami paper I picked up in Japan! 1. Place your gift inside a colourful paper bag. 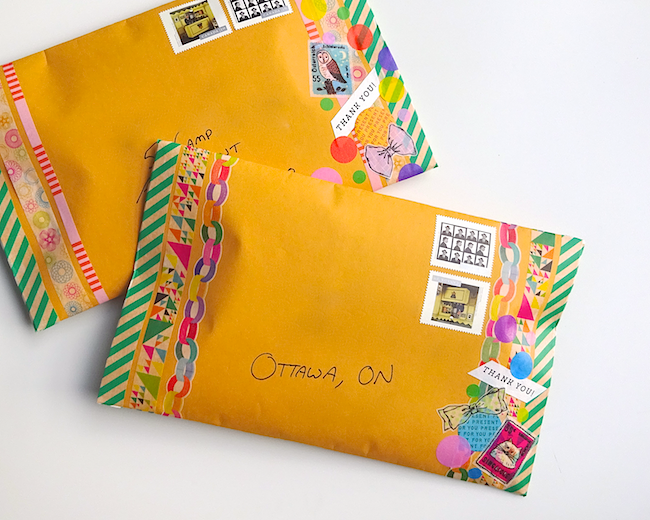 Fold and seal the bag at the bag with your favourite washi tape. 2. 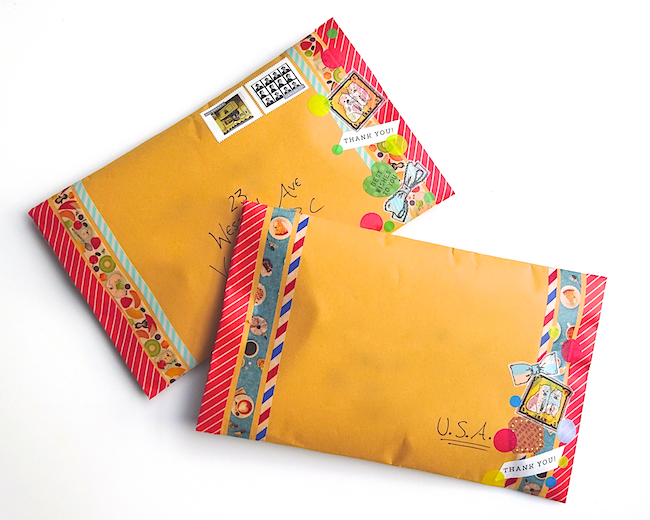 Attach a set of assorted stickers (or other flat treat) to the top with more washi tape. Pretty header cards always appreciated! 3. Tie colourful twine around the parcel. 4. Top with a trio of gift tags - first a collage-style tag decorated with washi tape, stickers and a piece of paper doily. Next a triangular tag cut out of polka dot paper. Finally, a bold circular tag punched from bright pink scrapbook paper. A touch of eighties style, a whole lot of fun! 5. Finish with a lovely twine bow! 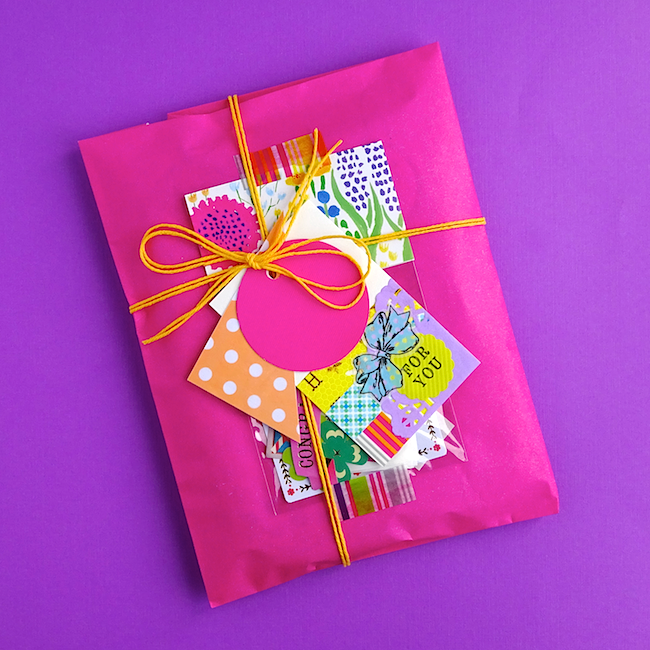 You can really use any paper or cardstock as a tag - just punch or cut into the desired shape, then use a holepunch to make a hole for your string. Then I packed them up in basic manila envelopes to ship across Canada and the world. But basic envelopes never do around here... I think my personal mantra might just be more is more! 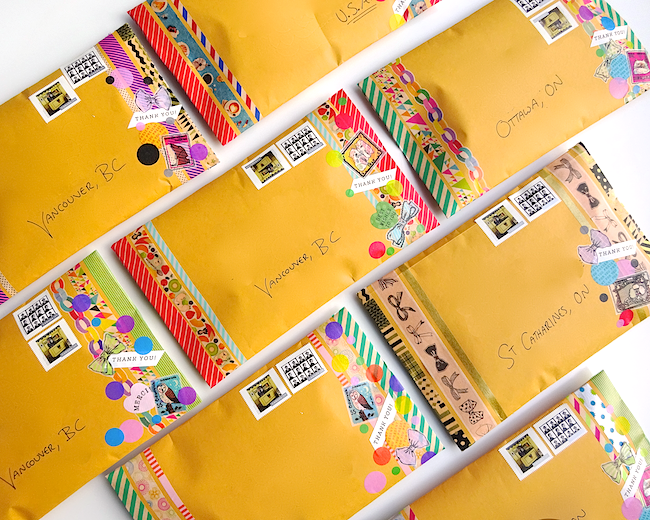 So strips of washi tape plus a medley of stickers were just the thing to fancify these boring envelopes. Each one dressed in its own unique combo of tape designs and stickers. I do love a good washi tape sticker! I can't decide which one is my favourite! Can they all be my favourite? How about you? 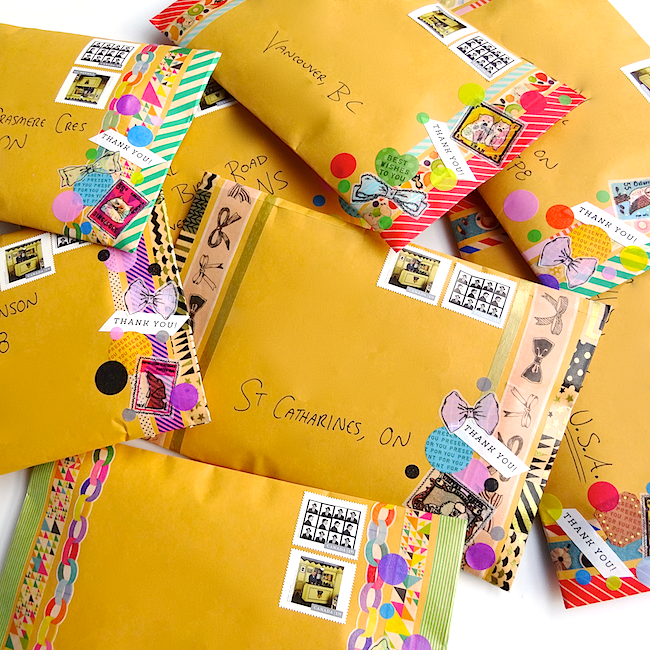 Have you sent any pretty parcels lately? 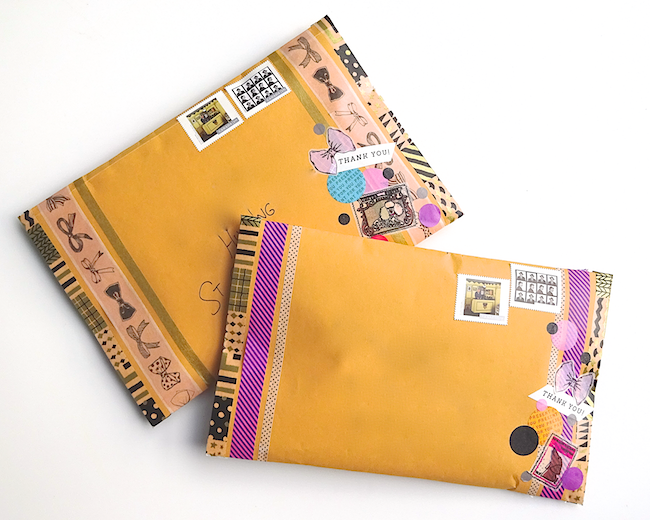 ;) Thanks Pat - mail packages look so much better dressed up a little, don't you think? !